The Norfolk County Fairgrounds is a 48 acre complex with a 3000 seat Grandstand overlooking a 1/2 mile race track, soccer field and wide infield. Serviced campground and many buildings from 900 to 23,000 square feet with services that are bound to suit your needs. Our professional staff is ready to assist in the planning, organization, and delivery of a first class event…your event. 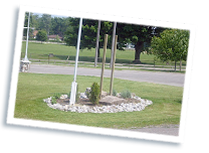 Grounds & Infield Paved & Grass Surfaces Food, Carnival, Commercial Vendors, Horse Shows, Parking. Accessible Washrooms Licensed Restaurant, Displays. Indoors: Level access on west side. Accessible Washrooms Outdoors: Horse and Grandstand Shows. Building #13 Upper: Ramped access.